The Zambesi basin. The Mutapa Empire was bordered by the Zambesi and Limpopo rivers. 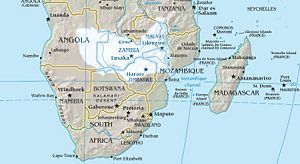 The Kingdom of Mutapa Empire (Shona: Wene we Mutapa; Portuguese: Monomotapa) was a medieval kingdom (c. 1450-1629) which stretched between the Zambezi and Limpopo rivers of Southern Africa in the modern states of Zimbabwe and Mozambique. A second Mutapa polity existed from 1803 until 1902. Its founders are culturally and politically related to the builders who constructed Great Zimbabwe. In the early seventeenth century, the Portugal Portuguese arrived in the area eventually colonizing what is now Mozambique. After gaining control of the Monomotapa in the early years of the century they were later driven out after a defeat in 1693. Rumor associated Monomotapa with the fabled city of the Biblical Queen of Sheba. The high plateau area does in fact have rich gold deposits. This may explain why early European maps of Africa often identify the territory. The empire was largely built on trade exporting copper and ivory. Initially, the Portuguese took part in this trade by transporting goods further to the East, to India. The Empire gave stable government to many people across a large territory for a century and a half. It represents a pre-colonial African polity that flourished before the coming of European rule. Written sources dating from 1502 make study of this Empire an important but neglected field. The Mutapa empire may not have been the equal of contemporary European empires in technology but its craftsmen produced high quality artifacts while trade was carefully regulated with set measurements and standards to ensure fairness. Knowledge of this empire, built up through commerce more so than conquest, can help to construct a balanced story of where, when and how human societies have flourished. The name Mutapa means "the conquered lands." The mwene (bantu term for "lord," specifically a conquering king) was the title giving rise to the state being referred to as Mwene Mutapa. This phrase has been preserved in documents as Munhu mu tapa, Manhumutapa, and the Portuguese, Monomotapa. The origins of the ruling dynasty at Mutapa go back to some time in the first half of the 15th century. According to oral tradition, the first "mwene" was a warrior prince named Nyatsimba Mutota from a southern Shona kingdom sent to find new sources of salt in the north. Prince Mutota found his salt among the Tavara, a Shona subdivision, who were prominent elephant hunters. They were conquered, a capital was established 350 km north of Great Zimbabwe at Mount Fura by the Zambezi. Mutota's successor, Matope, extended this new kingdom into a great empire encompassing most of the lands between Tavara and the Indian Ocean. The Mwenemutapa became very wealthy by exploiting copper from Chidzurgwe and ivory from the middle Zambezi. This expansion weakened the Torwa kingdom, the southern Shona state from which Mutota and his dynasty originated. Mwenemutapa Matope's armies overran the kingdom of the Manyika as well as the coastal kingdoms of Kiteve and Madanda. By the time the Portuguese arrived on the coast of Mozambique, the Mutapa Kingdom was the premier Shona state in the region. The religion of the Mutapa kingdom revolved around ritual consultation of spirits and a cult of royal ancestors. The ancestors advised the kings through mediums appointed by the court. Known as "mhondoros" these mediums maintained Shrines within the capital. The mhondoros also served as oral historians recording the names and deeds of past kings. Local lords, fumos, usually relatives of the king, were appointed to administer the provinces. Over time, some of these "lords" became hereditary." The King was "Lord of the Sun and the Moon, King of the Land of the Rivers and Conquerors of Enemies." Natural resources were thought to have been created by Mwari, the deity and could only be "exploited with the approval of the Mutapa, Mwari's earthly representative and custodian." When approaching the King, arms had to be left outside the city, and approach on bare feet. The Portuguese dominated much of southeast Africa's coast, laying waste to Sofala and Kilwa, by 1515. Their main goal was to dominate the trade with India, however, they unwittingly became mere carriers for luxury goods between Mutapa's sub-kingdoms and India. As the Portuguese settled along the coast, they made their way into the hinerland as sertanejos (backwoodsmen). These sertanejos lived alongside Swahili traders and even took up service among Shona kings as interpreters and political advisers. One such sertanejo managed to travel through almost all the Shona kingdoms, including Mutapa's metropolitan district, between 1512 and 1516. The Portuguese finally entered into direct relations with the Mwenemutapa in the 1560s. They recorded a wealth of information about the Mutapa kingdom as well as its predecessor, Great Zimbabwe. According to Swahili traders whose accounts were recorded by the Portuguese historian João de Barros, Great Zimbabwe was an ancient capital city built of stones of marvelous size without the use of mortar. And while the site was not within Mutapa's borders, the Mwenemutapa kept noblemen and some of his wives there. The Portuguese also left information about the capital of Mutapa. They paint a far different scene than that of Great Zimbabwe. The capital was built north of the granite outcrops that had supplied Great Zimbabwe and was composed mostly out of clay, wood and thatch. It was surrounded by a wooden stockade that could be walked around in an hour. Within there were three public enclosure. One was where the mwenemutapa held court, another housed his wives and courtiers whom numbered some 3000 and the last for pages and bodyguards recruited among the young unmarried men throughout the kingdom. These men would later serve as soldiers and administrators. According to Chanaiwa, the empire was loosely knit together and its unity depended on the "charisma, well-being and political wisdom of the ruling Mutapa." The Mutapa did not intervene needlessly in the lives of his subjects. He appears to have realized that if the people enjoyed a reasonable living standard and a stable society, their loyalty could be expected. The Empire engaged in importing goods as well as in exporting them. Imports included such luxury goods as silk, ceramics and glassware. Gold and silver was made into bracelets "and other insignia of rule" by local craftsmen. A cloth known as Machira woven from local cotton was draped over the ruler's throne as a symbol of his kingly rule. Gifts were given by the king to officials and regional governors to ensure their loyalty. Trade was centrally regulated, with weights and measures controlled by the court. The Mutapa also regulated "the volume of local produce on the international market" to maintain "a favorable balance of trade." In 1561, a Portuguese Jesuit missionary managed to make his way into the mwenemutapa's court and convert him to Christianity. This did not go well with the Muslim merchants in the capital, and they persuaded the king to kill the Jesuit only a few days after the former's baptism. This was all the excuse the Portuguese needed to penetrate the interior and take control of the gold mines and ivory routes. After a lengthy preparation, an expedition of 1,000 men under Francisco Barreto was launched in 1568. They managed to get as far as the upper Zambezi, but local disease decimated the force. The Portuguese returned to their base in 1572, and took their frustrations out on the Swahili traders whom they massacred. They replaced them with Portuguese and their half-African progeny whom became prazeiros (estate holders) of the lower Zambezi. Mutapa maintained a position of strength exacting a subsidy from each Portuguese captain of Mozambique that took the office. The mwenemutapa also levied a duty of 50 per cent on all trade goods imported. During the fifteenth century, the Mutapa maintained unity and managed to restrict Portuguese attempts to gain control of the "markets and trade routes," exercising "effective sovereignty". Mutapa proved invulnerable to attack and even economic manipulation due to the mwenemutapa's strong control over gold production. What posed the greatest threat was infighting among different factions which led to opposing sides calling on the Portuguese for military aid. In 1607 and 1629, Mutapa signed treaties making it a Portuguese vassal and ceding gold mines, but none of these were ever put into effect. Another problem was that Mutapa's tributaries such as Kiteve, Madanda and Manyka ceased paying tribute. At the same time, a new kingdom called Barwe was the rise. All of this was hastened by Portugal retaining a presence on the coast and in the capital. At least one part of the 1629 treaty that was acted on was the provision allowing Portuguese settlement within Mutapa. It also allowed the praezeros to establish fortified settlements across the kingdom. In 1663, the praezeros were able to depose a sitting mwenemutapa and put their own nominee on the throne. By the 1600s, a dynasty of Rozwi pastoralist under the leadership a changamire (king) were leading transforming the Butwa kingdom into new regional power. 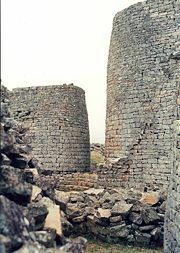 The Rozwi not only originated from the Great Zimbabwe area, but still resided there and built their capital towns in stone. They were also importing goods from the Portuguese without any regard for the mwenemutapa. By the late seventeenth century, Changamire Dombo was actively challenging Mutapa. In 1684, his forces encountered and decisively defeated those of Mwenemutapa Mukombwe just south of Mutapa's metro district. When Mukombwe died in 1693, a succession crisis erupted. The Portuguese backed one successor and Dombo another. In an act which effectively made Mutapa a Butwa vassal, Changamire Dombo razed the fair-town of Dembarare next to the Mutapa capital and slaughtered the Portuguese traders and their entire following. In 1695, Changamire Dombo over-ran the gold-producing kingdom of Manyika and took his army east and destroyed the Portuguese fair-town of Masikwesi. This allowed him complete control of all gold-producing territory from Butwa to Manyika, supplanting Mutapa as the premier Shona kingdom in the region. The reign of the last mwenemutapa to rule from the rump state ended in 1698, and his position was never filled. Remnants of the government established another Mutapa kingdom in Mozambique that is sometimes referred to as Karanga. The Karanga kings styled themselves Mambos (singular Mambo) and reigned in the region until 1902. This is referred to as the Second Mutapa State. The empire had another indirect side effect on the history of Southern Africa. Gold from the empire inspired in Europeans a belief that Munhumutapa held the legendary mines of King Solomon, referred to in the Bible as Ophir. The belief that the mines were inside the Munhumutapa kingdom in Southern Africa was one of the factors that led to the Portuguese exploration of the hinterland of Sofala in the 1500s, and this contributed to early development of Mozambique, as the legend was widely used among the less educated populace to recruit colonists. Some documents suggest that most of the early colonists dreamed of finding the legendary city of gold in Southern Africa, a belief mirroring the early South American colonial search for El Dorado and quite possibly inspired by it. Early trade in gold came to an end as the mines ran out, and the deterioration of the Mutapa state eliminated the financial and political support for further developing sources of gold. For several centuries, this trading empire enabled people across a large territory to live in peace and security under a stable government and succession of rulers. With primary records dating back to 1502, the empire is a "prime testing ground for theories … concerning economic, political and religious development" in pre-colonial Africa. Beach comments that the Mutapa was one of only four Shona states that was not entirely "uprooted by new settlements of people" and the only one "close to Portuguese centers" thus providing important data on contact and relationships between this and other Shona states as well as with Europeans. The Mutapa Empire is an example of a working system of government in Africa and of a flourishing civilization, both of which are often assumed to have been absent before the coming of the Europeans. ↑ 1.0 1.1 D.N. Beach, The Mutapa Dynasty: A Comparison of Documentary and Traditional Evidence, History in Africa 3(1976): 1-17. ↑ 2.0 2.1 2.2 Oliver and Atmore (1975), 203. ↑ 3.0 3.1 3.2 3.3 3.4 3.5 Oliver and Atmore (1975), 204. ↑ 4.0 4.1 Oliver and Atmore (1975), 205. ↑ David Chanaiwa, Politics and Long-Distance Trade in the Mwene Mutapa Empire during the Sixteenth Century, The International Journal of African Historical Studies 5(3): 426-435. ↑ 6.0 6.1 Chanaiwa (1972), 430. ↑ Oliver and Atmore (1975), 206. ↑ Oliver and Atmore (1975), 207. ↑ Heillbrunn Timeline of Art History, Southern Africa, 1600–1800 C.E. Retrieved September 22, 2008. ↑ 13.0 13.1 13.2 13.3 13.4 Oliver and Atmore (1975), 208. ↑ Oliver and Atmore (1975), 209. ↑ African Kingdoms, African kingdoms: A history of Nobility and Splendor. Retrieved September 22, 2008. ↑ D.N. Beach, Review: The Mutapa State by D.N. Beach. The Journal of African History. 17(2): 311-313. Chigwedere, A.S. 1980. From Mutapa to Rhodes, 1000 to 1890 C.E. London: Macmillan. ISBN 9780333281581. Elkiss, T.H. 1981. The Quest for an African Eldorado: Sofala, Southern Zambezia, and the Portuguese, 1500-1865. Waltham, MA: Crossroads Press. ISBN 9780918456410. Oliver, Roland, and Anthony Atmore. 1975. Medieval Africa 1250-1800. Cambridge: Cambridge University Press. ISBN 0521204135. Pikirayi, Innocent. 2001. The Zimbabwe Culture: Origins and Decline of Southern Zambezian States. Walnut Creek, CA: AltaMira Press. ISBN 9780759100916. Wills, Alfred John. 2001. An Introduction to the History of Central Africa: Zambia, Malawi and Zimbabwe. London: Oxford University Press. ISBN 9780198730767. This page was last modified on 6 October 2008, at 13:28.